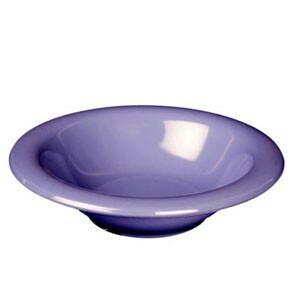 Use the Thunder Group CR5712BU Purple Melamine Soup Bowl 15 oz. to serve soup, cereal, or pasta dishes in style. A stunning addition to any table setting, this bowl is available in seven attractive colors that easily coordinate with any dinnerware collection. Combining style and functionality, this NSF approved bowl has a wide rim for ease of handling and a flat footed base for stability. Thanks to its heavy-duty melamine construction, this easy-to-clean soup bowl is break resistant to withstand years of use. $19.99 Thunder Group 5106TR Longevity Melamine Deep Bowl 15 oz. $14.74 Winco MMB-15 Tan Melamine Nappie 15 oz. $14.74 Winco MMB-15W White Melamine Nappie 15 oz.